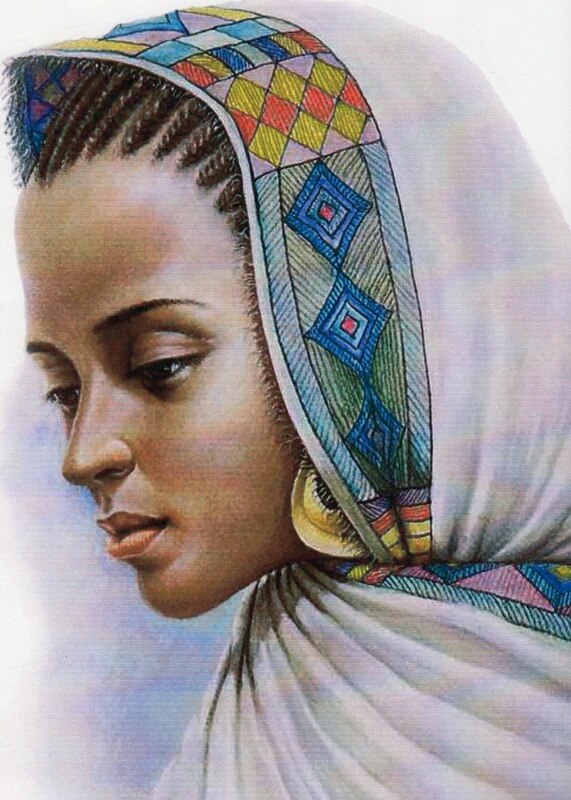 Ethio Helix ኢትዮ:ሒሊክስ: The Mother of Mothers ! The Mother of Mothers ! It has been well known for about 20 years now that the mother of all Non-Africans, and indeed a lot of Africans, was an East African woman, in more recent nomenclature this woman has been called L3, so what do geneticists recently say about this woman, mother to greater than six and a half billion people on Earth, including many who still inhabit her original homeland? The most recent study conducted to uncover the story behind L3 and her compatriots was one from the end of last year entitled “The Expansion of mtDNA Haplogroup L3 within and out of Africa”. This important study capped the timing of the out of Africa migrations, which all contemporary men and women outside of Africa are descended from, to no earlier than Seventy Thousand Years Ago. 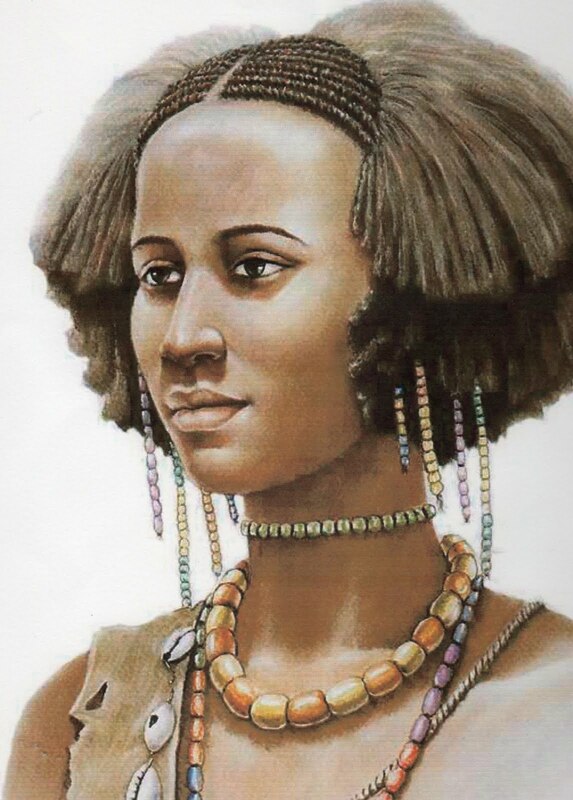 Meaning, since all Non-Africans are descended from this woman, the timing of the out of Africa migration can not be any older than when she lived and can not be any younger than when here descendant daughters M and N lived, although there still remains a possibility that M and N emerged in Africa, albeit increasingly unlikely. So what were the main results of the extensive statistical analysis done on this lineage? Schematic tree of haplogroup L3. Age estimates are respectively rho estimates from the complete mtDNA genome (black font), rho estimates using the synonymous clock (gray font), and ML estimates using the complete mtDNA genome (black font underlined). Color scheme for each clade indicates the probable geographic origin. Haplogroups M and N are indicated and age estimates are according to Soares et al. (2009). MSA refers to Middle Stone Age and LSA to Late Stone Age. i) Approximately 40 thousand years ago corresponding with the emergence of the various intra-African subclades of L3. iii) The largest increase of the expansions detected around four thousand years ago and most pronounced in the Central African Bayesian Skyline Plots. E) L3f and L3eikx both implied to have an origin in Eastern Africa. Where L3f was carried into the Sahel and Central Africa, with L3f3 specifically expanding into the Sahel 8 to 9 thousand years ago. F) The most frequent clade of L3, i.e. L3e implied to have an origin in Central/Western Africa. With Eastern African L3e discounted as more recent introgression from there. “L3bcd has three main subclades, with L3b and L3d tentatively united by a transition at control region position 16124 to form the putative subclade L3bd. The great age of L3bcd and its wide distribution across Africa makes phylogeographic inferences difficult. Furthermore, L3c is extremely rare: Only two samples have been detected so far, one in Eastern Africa and the other in the Near East. This might echo an early origin of L3bcd in Eastern Africa, before moving west, but its rarity makes this conclusion extremely tentative. In a scenario of an early origin of L3bcd in Eastern Africa, M and N would be the only subclades of L3 to have most likely originated outside of Eastern Africa (although an origin in Eastern Africa remains possible: Richards et al. 2006). H) A virtual exclusion of a scenario in which the ancestors of contemporary people outside of Africa migrated out of Africa before the eruption of Toba. “Furthermore, since the age of the M and N Eurasian founders of ;50 to 65 ka (Soares et al. 2009) is close to the age of their ancestral L3 clade in Africa, the out of-Africa dispersal may have been of a piece with the initial diversification and expansion of L3, so that the L3 expansions in Eastern Africa and the exit of modern humans from Africa;60 ka were all part of a single demographic process. Interestingly, the previous explanations that the Out of Africa expansion of modern humans being linked with behavioral modern thinking is largely dismissed by these authors for the sole explanation of Environmental factors, their main reasoning being that there is evidence for behavioral modernity of humans in Africa (Both in South and North Africa) long before their proposed timing of the OOA migrations. “Thus, as suggested by Basell (2008), the demographic expansions that led to the first successful dispersal out of Africa seem better explained by the play of palaeoenvironmental forces than by recourse to the advantages of ‘‘modernity." ** Sketches on top of page depicting contemporary women that still live in the putative land of L3's origin. Credit goes to Ethiopian Artist Adis Gebru and taken from this blog. A very interesting study, even if I have to disagree with the age estimates, which are probably (based on the archaeology of Arabia and India) more c. 90 Ka or even maybe 125 Ka., within the Abbassia Pluvial surely in any case. I have reblogged this (in my own style but with due credit) at FWTWWA. I must also say that your choice of portraits is surely not too accurate as those women are obviously influenced by genetic back-flow from Asia. I'd rather pick tribal women from the SW as more likely representatives (the centroid of L3 certainly falls over there, right at the border with South Sudan, although its precursors L3'4'6 and L4'3 look more centered towards Eritrea instead). I am beginning to sense some sort of a romantic fixation that you have with 'South Western' Ethiopia Maju. I clearly and explicitly said that those sketches, and I emphasize sketches instead of the random pictures that you took the liberty to post, represented women that inhabit the area of the putative origin of L3 as outlined in the subject of the paper, that does off course not mean that the original L3 bearer exactly looked like them, since nobody really knows what they looked like. The Area outlined in this paper for L3's origin is approximately bounded in the North by Khartoum, North Sudan, in the East by Awash, Ethiopia, in the South by around the middle of Lake Turkana, Kenya and in the West by Agok, Abyei South Sudan. This is a large area with numerous types of people living in it, but mostly just Nilotes , that is Nhilo Saharan speakers and Afroasiatics. You can not simply just say these people are 'white' looking or 'black' looking as likely all 'black' and 'white' looking people originated in this region, there is nothing surprising about finding people who have a 'white' morphology in this area. As for your back migration hypothesis as to why the pictures I selected are unjustified, you first have to prove what the people who back migrated looked like, you also have to quantify what physical divergence these people had to the people of the area they back migrated to, and remember that it is not called back migration for no reason, those people went back to whence they came from, so in essence they were the same people. In addition, before you nonchalantly throw around terms like 'Oromia', and 'Semitics', the woman in the middle of my selected sketches is an oromo lady, have you any clue as to the numerous type of people that live in these regions? They are not monolithic, have been cross pollinating with each other for millenia upon millenia, and the languages they speak bear little to no witness to the genesis of their physical types. Please cease with your tourist-like romantic fixation of certain African peoples that you pick and choose at whim. Now as to the paper, I'm glad you found it interesting, to me also it was one of the best genetic papers done on Africa that I have read in quite some time, besides Tishkoff and some of the Cruciani papers. It was well sourced, with tones of references and a great read. What happens is that when I have in the past estimated the origin of L3 and other lineages (L5 and possibly mtDNA "Eve" herself) the area between the SNNPR and South Sudan almost systematically shows up as natural geometric centroid. I already said that L3'4'6 and L3'4 look more towards Eritrea or Djibouti, so there's room for debate (and indeed I meant to stir up some debate - healthy and in good mood). Also the Omo river, considered to be (on archaeological grounds) a most likely urheimat (notice that I do not say "the urheimat" but "an urheimat") of Homo sapiens drains the SNNPR and West Oromia, so the data accumulates in that area, with permission of Herto and Irhoud, of course. Call it a fetish if you wish but, if anything, it is a fetish fed in its specificity by data. When I was younger my anthropological "fetish" was surely more like the Kalahari and not long ago I was fascinated with the Hadzabe but it's good that the mind wanders a bit... as long as it is justified. Too much of the same thing gets boring. But anyhow the ethnic diversity of that area, including tribes that, while not anymore huntergather (isn't there one or two that used to be so till recently? ), have extremely traditional and often exotic and thought-provoking ways of life. "the woman in the middle of my selected sketches is an oromo lady"
I though that she's the less "white" of the three. Some Semitic Ethiopians have very narrow noses, even more than the most narrow-nosed Europeans. Maybe that's an ancestral trait of the L3 clan but it may also be the product of back-flow and the fact that the trait is concentrated among Semitic speakers, who concentrate most of the genetic back-flow from Asia, makes it somewhat suspicious. ... "there is nothing surprising about finding people who have a 'white' morphology in this area". Not but yes when it happens to be concentrated among ethnicities who are known to have important apportions of lineages that have back-migrated from Eurasia. You cannot obviate that. It'd be like defining Europeans in relation to Saami (who have notable Siberian ancestry) or the Bantu based on Xosha (who have lots of Khoisan genetics). You must look for populations which retain the original brew in the best possible way. I sincerely thought that those portraits have a "Bollywood" feeling to me: Bollywood actresses and actors are indeed Indian types but almost invariably of the whitest-looking variants. This is not imported (colonial) racism but a type of somewhat more subtle racism brewed mostly inside South Asia with deep historical roots. I assume (although I do not know for sure) that something like that may happen in Ethiopia, where the Amhara and other Semitic groups have held for long primacy and may have looked upon other ethnicities with some pretense of superiority. I am assuming that you are of Amhara or otherwise Semitic (Tigray?) ethnicity, right? (IV) Autosomal DNA: Take a look at the differences between Cushitic speakers and Semitic speakers in the various Amateur projects out there. Take note that the relevant Cushitic speakers to compare semitic speakers to are the central cushitic speakers, also known as Agews, you can use the Beta israel or Ethiopian jews as a proxy for them. The lowland east cushitic speakers have a slight difference in Autosomal gentics than the central Cushitic speakers. "I assume (although I do not know for sure) that something like that may happen in Ethiopia, where the Amhara and other Semitic groups have held for long primacy and may have looked upon other ethnicities with some pretense of superiority." ^ Look again above, the myth that semitic and cushitic speakers of Ethiopia have a major difference in their genes is just that: A MYTH. The Ruling elite in Ethiopia for the past several hundred years have all been of mixed origins. "I am assuming that you are of Amhara or otherwise Semitic (Tigray?) ethnicity, right?" I am neither an Amhara nor Oromo nor a Tigre, rather I am an Ethnic Ethiopian with ancestry that includes not only all those groups but also Agews, and maybe also some other peoples that have long died out. My mother tongue is Amharic, my paternal haplogroup is E1b1b1* * (ancestral) and my maternal haplogroup is L3h2. EDIT: "The Ruling elite in Ethiopia for the past several hundred years have all been of mixed origins." Typo: The Ruling elite in Ethiopia for the past several THOUSAND years have all been of mixed origins. 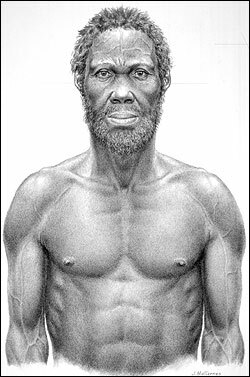 "you first have to prove what the people who back migrated looked like"
I cannot prove anything, the closes to evidence I may wield is the well known Herto man (Idaltu) reconstruction, who certainly does not have that narrow nose. But of course it is a reconstruction and hence arguable. 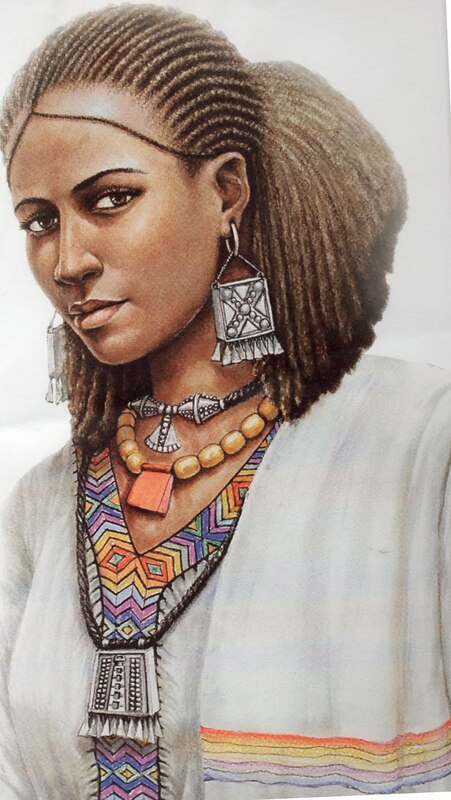 But I do have an opinion and it disagrees with your choice, which I find shockingly bollywoodian (because even for Amharas, those women look whitey, in the "whitest" possible range - just google "Amhara woman" as image, please). Consider also that the ancestral L3 types eventually evolved not just in European or West Asian "Caucasoid" types but also South Asian, East Asian, Australian Aboriginal, Melanesian, Native American types. And that only considering the M and N sublineages, with other five basal lineages expanding to Africa (including North Africa and probably in part Arabia pen.) So the prototypes would have to account for most of the phenotype diversity on Earth right now, what makes impossible to discern how they might have looked. "Please cease with your tourist-like romantic fixation of certain African peoples that you pick and choose at whim". Of course my selection is arbitrary but not any more arbitrary than yours. I remain persuaded that my selection includes less back-migrant genetics in any case and therefore most likely reflects the phenotype reality of the past in that area (up to a point). Whatever the case I did not mean to offend you but I was really struck by the choice of portraits, which is not any less romantic than mine, just that in a different direction of preference. It is a very interesting paper in principle (I do not have a copy so I'm relying on what you wrote 100%). It fits very well with what Behar (and separately myself on his data) have concluded on the patterns of human expansion in Africa based on mtDNA lineages (as you know Y-DNA and autosomal DNA are contradictory however). Specially it seems true for L3. I for one tend to be more inclined for the Upper Nile region rather than The Horn as such (for the human and L3 homeland) but whatever. ... "to me also it was one of the best genetic papers done on Africa that I have read in quite some time, besides Tishkoff and some of the Cruciani papers". There has been growing interest in Africa, even if it is yet patchy. I have mentioned before the Behar 2008 paper and I'm a bit surprised that you did not mention it, nonetheless because he also has some nice maps that "show" (?) that Ethiopia is the mother of humankind (at least mtDNA wise). As said, I'm rather more inclined for the Upper Nile are in general including much of Sudan and maybe Uganda and such, but it's almost demonstrated (at least mtDNA-wise) that that are is the urheimat of not just the L3 clan but probably all modern humankind. "Consider also that the ancestral L3 types eventually evolved not just in European or West Asian "Caucasoid" types but also South Asian, East Asian, Australian Aboriginal, Melanesian, Native American types. And that only considering the M and N sublineages, with other five basal lineages expanding to Africa (including North Africa and probably in part Arabia pen.) "
Exactly, I agree completely with this statement. "Whatever the case I did not mean to offend you but I was really struck by the choice of portraits, which is not any less romantic than mine, just that in a different direction of preference." No offense taken, I just chose the portraits of my liking, you chose pictures of your liking, as long as the pictures and portraits come from people that live in the putative land of L3's origin as outlined in the subject of the paper I think they are all reasonable, again with the caveat that nobody really knows what they looked like. P.S. Behar 2008 was another good paper, I agree. A large portion of the 'Somalis' they sampled in this study living in Yemen are not ethnically Somali at all. They possessed way too many blatantly foreign lineages (HV1b, L1c, L3e, M51a just to name a few ..heck even Khoisan L0d and Austronesian B4a1a!). I suspect many of them were from the southern coastal Swahili Afro-Arab origin groups who were ousted after the civil war and mainly fled to Yemen. Another Y-DNA study which sampled Somalians in Yemen had very strange haplogroup frequencies (too high J1) as well. It's a pity they didn't check for ethnicity. Too many non-natives were included here, because this looks like very bad sampling. The Data set of 148 Somalis reported in the supplemental file had 62% L, 11% M, 10% N and the remainder ~17% of miscellaneous maternal lineages (R0, HV etc..) this is consistent with other maternal data done on East Africans, I'm not sure what exactly you are talking about, could you provide specifics (percentages). Thanks. There were many conspicuous foreign lineages in this set, even some Indonesian sub-clades (I mean c'mon..). So this group is not very representative of the native Somali mtDNA gene pool. Also, a frequency of 8% HV1b is nonsensical. I'm Somali (it's me Bandar if you remember :) ) and in my RF list over at 23andMe combined with my Somali friend's RF list there are about 40 different Somali individuals and not a single one is HV1b. A sharp contrast with this study. All in all it looks like a nontrivial amount of these individuals were not ethnically Somali. I suspect that Swahili origin groups were over-sampled. A large portion of the Bravanese community lives in Yemen. Selam Alaikum Bandar, thought it was you. In any event, The data said it was from Somali Refugees in Yemen, which should be a good cross-section of Somali data. It was also approved by an Ethics committee, unlike your 23andME samples, not that I am saying that your 23andMe samples are fraudulent, but that this data has more integrity to it, besides it has over 4 times the number of samples than what you have. 7/148 samples had HV, I'm not sure why you are surprised by this, have you seen the interpolation map for HV1 in Musilova et. al (2011) ?? the highest concentration of HV they had was in Southern Somalia, 6.3 - 7 %, consistent with the data in this paper. Other miscellaneous haplogroups like B4a1a1a, are so infrequent (2/148) that it is negligible. As for L3e in Somalis, they had: 1 X L3e1a1, 1 X L3e1d and 3 X L3e3 , so total 4/148, big deal and not surprising as Somali Bantus do exist and they may have (if even infrequently) bred with other Somalis. Typo:"1 X L3e1a1, 1 X L3e1d and 3 X L3e3 , so total 4/148"
Thanks. Well, I actually count 10/148 HV, 2/148 T2c/T2e, 2/148 B4a1a1a, 4/148 South/East Asian M types (M5, M51a1, M76, M7b1), 5/148 L3e, 2/148 L1c, 2/148 L3b, 1/148 L0d. That's at least 28/148 who clearly have exogenous lineages, and there may be even more. IMO it looks like this group consisted of a large number of non-Somalis. I suspect Bravanese people (a Swahili group) since they mainly migrated to Yemen. I am sure if one took Y-DNA from this same group it would look quite deviant. Just like that group sampled in Yemen by Immel et al. Alright. You seem correct in that, however I'd take more the "unspecified Ethiopians" group, whatever they are because they have much less back-migrant Eurasian Y-DNA F (incl. J and T) than the rest (30% back-migrant blood is too pretend being ultra-aboriginal at the level we are discussing here). Maybe I've gone too far in some of my conclusions: I stand corrected re. the Semitic/Cushitic issue (though I still have some doubts) and I apologize for whatever unfair statement I made. However I still think it's more correct to search, as much as possible, for the peoples of more neatly non-migrant African stock - i.e. with less West Eurasian back-flow, which can only be misleading. Where Bench, Dizi and Hamar are Omotic. Dasanech, Konso and Tsamako (also known as Tsamai) are Cushitic. The Berta, Mjangir, Nyangatom and Surma are Nilotic. And Ongota is just Ongota (Another possible and dying branch of Afroasiatic). ^Again, I'm not sure about all this it is just a hunch. For the samples from de fillipo et. al 2010, the supplement file says from Omo Valley, but the location given also says Addis Ababa, so again, it is ambiguous, hence why I labeled them as unspecified Ethiopians. Check out this new study about adaptation to high altitude in Ethiopians. It might be of interest to you. Excellent, Thank you for bringing this to my attention, I will read it thoroughly. There seems to be 1 Million SNPs scanned from Omotic speakers, this seems to be a first. Additional highland samples are available as well, with higher resolution from the Behar 2010 samples (500K). I'll try to experiment with it when it's out. Hopefully it will show something interesting. Languages apart, they are almost all from the SNNPR (the two exceptions are from nearby areas). While I may have been wrong by establishing the divide in the linguistic realm, the intuition I had was not that bad. On the other hand it can be hard to exclude migration from other parts of Africa. In any case I can't but notice the high diversity the SW Ethiopians have in African specific Y-DNA lineages, with important amounts of E2, E* and B, lacking in other Ethiopians. They are an interesting bunch. And I imagine that there is also interesting stuff the other side of the border in South Sudan (and maybe also North Sudan). It's not fetish as much as knowledge that there is a lot to dig in that area, which looks very much like the ancestral homeland of Humankind (or something close to that). The pre-Toba data and Horn source for Out of Africa is a bit hard to swallow given the mounting evidence for older dates out of Africa and archaeological links between the Nile Valley and points South to internal Arabian sites (as opposed to coastal ones). Maybe there was replacement during the roughly 25,000 year gap in Levantine modern humans, but it would have to be pretty complete replacement given the mtDNA makeup of Eurasia. I'm less skeptical of relative mtDNA dates than for Y-DNA or autosomal DNA, but color me skeptical on the accuracy of the calibration and the accuracy of the demographic models. A +/-4% accuracy assumption seems wildly optimistic given the systemic uncertainties. In the larger African context, certainly, it seems like every other mtDNA hg but L2 did get pretty much swamped by L2 and L3. But, our pre-Bantu models of what was going on with African populations are pretty fuzzy, and I'm skeptical that the population structure observed is really as old as claimed. 70kya does stick in my mind as close to the oldest harpoon fishing evidence. "and archaeological links between the Nile Valley and points South to internal Arabian sites (as opposed to coastal ones)." Yes, the main OoA flow was probably not based on the Nubian techno-complex, even if these are part of the wider picture. The characterization of Petrarglia 2007 for the Indian late MP toolkits is one of "Southern African MSA". This does not only exclude a Nubian but probably most East African cultures in fact - even if we know from genetics that the Eurasian gene pool has unmistakable East African origins. Petraglia seems to favor a late (c. 90 Ka.) OoA via the interior of Arabia, while an alternative early (c. 125 Ka.) chronology is proposed by Armitage (I contrasted both options here). I'm personally most sympathetic with the Armitage option because it is the only one that (taken as it is, the Petraglia model may need revision anyhow) fits with the genetic evidence but the evidence from South Asia (see Petraglia 2010, fig. 4) lacks data between c. 105 Ka and c. 80 Ka., rather not supporting an early exit. In any case, the people of the Nubian and all other cultures involved were practically certain H. sapiens ("moderns") because there are no other remains so late in all the area except a few Neanderthals from West Asia, invariably with Mousterian tech. Do anyone have information on L3e1a1? Behar 2008 found it in Arabia Peninsula only (not sure which country/countries right now, check the supp. materials). Not sure how to interpret this commonality of L3e1 clades in West Asia. More research is clearly needed but a possibility is that branches of this lineage, maybe coalesced somewhere in East Africa very long ago (judging on where it is found) might have expanded into that region via the Red Sea in the Paleolithic (there are other suspect lineages especially in the L0, L4 and L6 clades). A more "classical" (or lazy?) interpretation is that they arrived with the Indian Ocean trade routes, including but not necessarily the slave trade, but the connection with South Africa instead of Tanzania, Kenya, etc. appears to contradict this. But, as I said, more research is needed. Africa is a very large and even more diverse continent and researchers, most of which have European or Asian ancestry (and financing), have been most focused elsewhere, only scratching the surface of African genetic landscape. PS- As I'm telling from my notes it is possible that Behar also found it in African-Americans, just that because of their ancestry being so imprecise, I decided to ignore those samples. Again check the supp. materials to be more certain. I actually look eerily similar to the outer 2 pictures I was also born in Africa and am part of the L3e1a2 maternal haplogroup. My maternal side looks more "arab" and my paternal side members I know of all look predominately Bantu/Central African. Those 2 pictures look more like me than my family members living today.